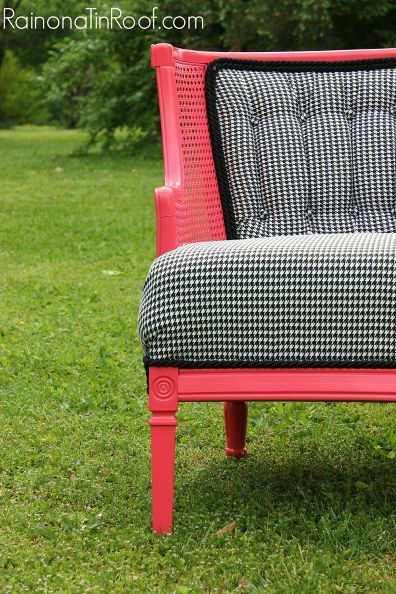 Ansley Designs: Crazy for CORAL Painted Furniture! 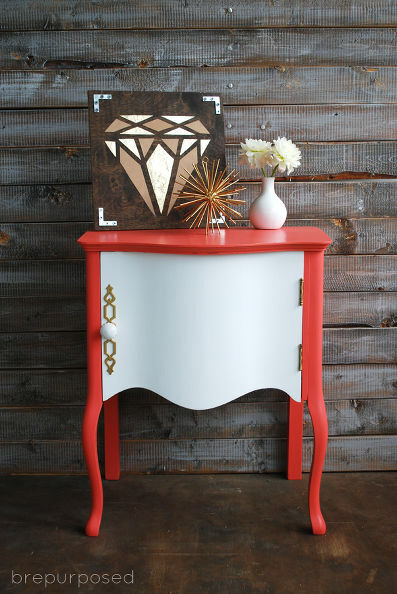 Crazy for CORAL Painted Furniture! HomeTalk asked me to put together another board featuring fabulous CORAL furniture since they lurve my coral and white campaign nightstand. It's the perfect assignment for me because I lurve furniture! Like really! 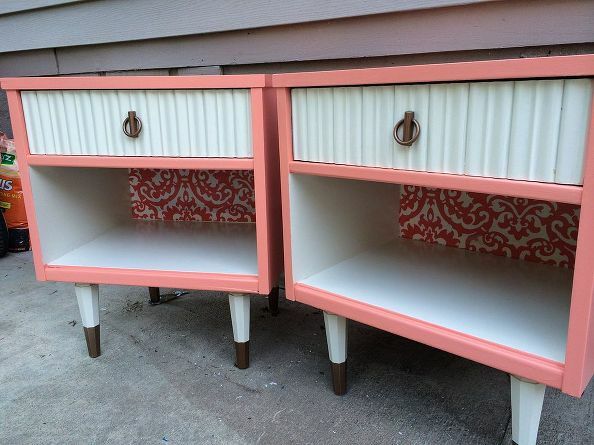 Who doesn't love a good dresser makeover...especially in coral! 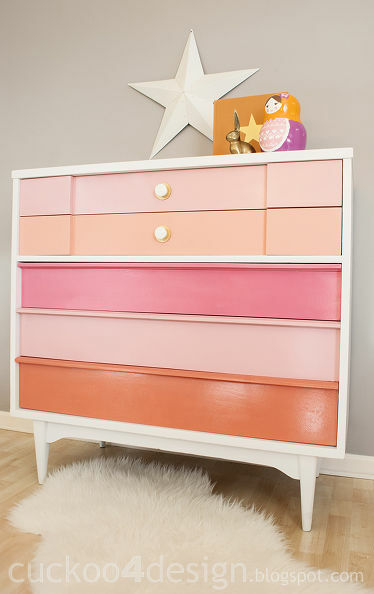 It's funny, this dresser I originally refused to click on because it just showed the before photo and the description said "pink, coral, and orange" which just sounded hideous to me. After seeing it, it's one of my favorites! It reminds me of sherbert ice cream! If I had noticed it was from Cuckoo4design, I would have had more faith...her stuff is so great! I loved this the moment I saw the preview image! How unique. The graphic looks so professional and PERFECT! I just couldn't click on this image fast enough when I saw it! Sadly there's not really any information on the piece, and this is the sole picture! Coral, white, campaign hardware - this is the most perfect changing table dresser eva! 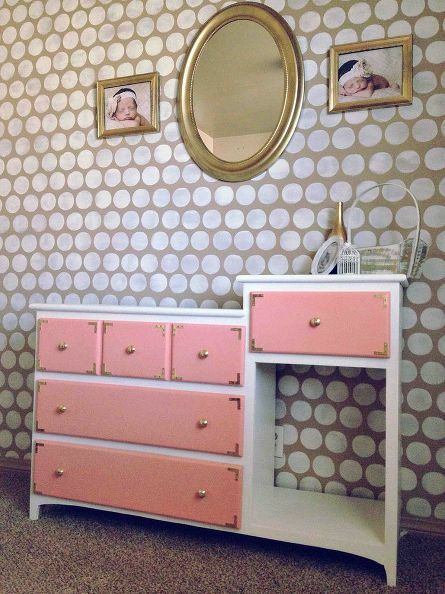 I love this whole picture, the frames, the polka dot wall - just perfection! I can never get enough ombre, and this piece fits the bill! 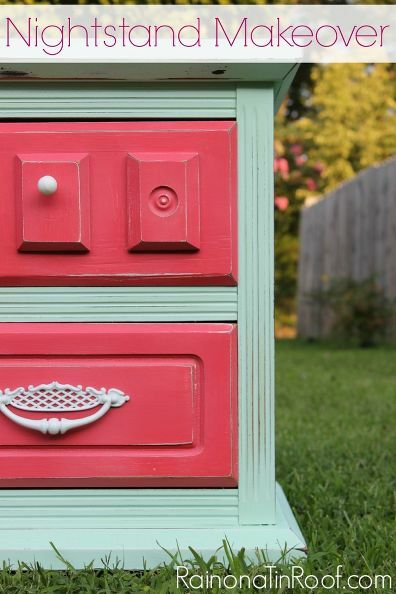 I'm loving the color combo on this cute vintage dresser! She gives color specifics on the post! You know I couldn't make a compilation of coral furniture without including my own pieces! 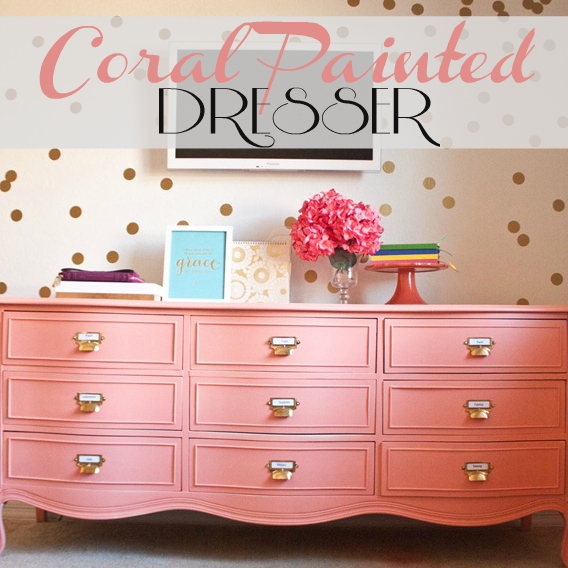 For starters, here's Reagan's gold dipped coral dresser! (go here to see it on HomeTalk!) AND an exclusive peek of it with the gallery wall. I guess it's more than a peek, really! I kept the dresser mostly out of the photos when I posted about her thrifted gold frame gallery wall. 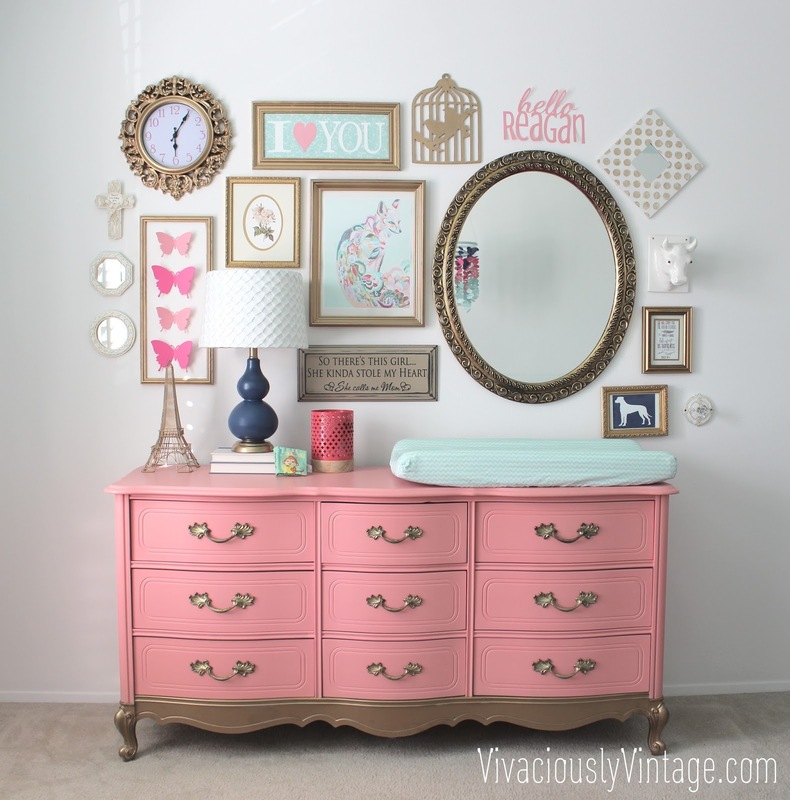 This dresser is the same style as mine, but she used card catalog pulls to update the look! I love that hardware! This chair. Oh emmm gee! I could just faint right into it and never get up again! These are really cute too! 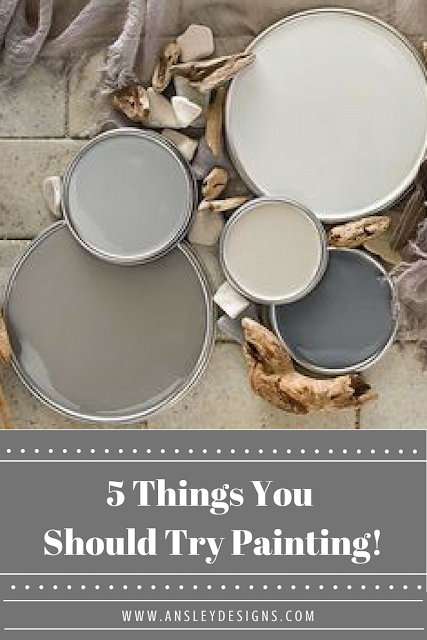 And they look like an almost perfect match for the ombre dresser! They all belong in a room together! 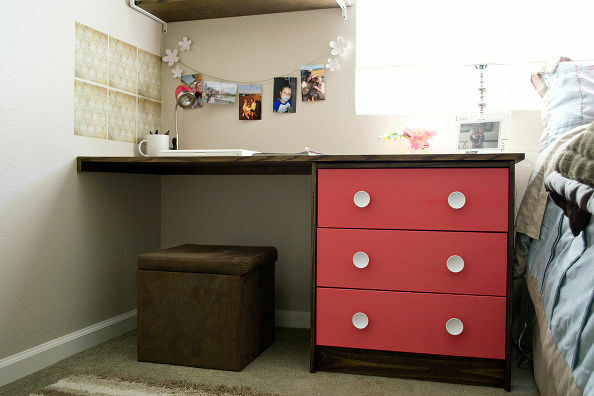 I love this DIY coral and wood desk! 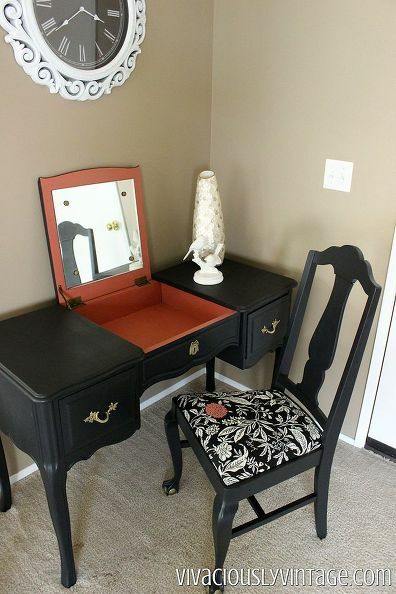 She used an existing nightstand to customize a desk for the space! Such a great idea! This piece is amazing! I never would have thought to leave the entire door white on a piece like this, but it works. It's what makes the piece deserve a double take! The inside has way cute paper lining the back as well! Another lovely shade of coral! 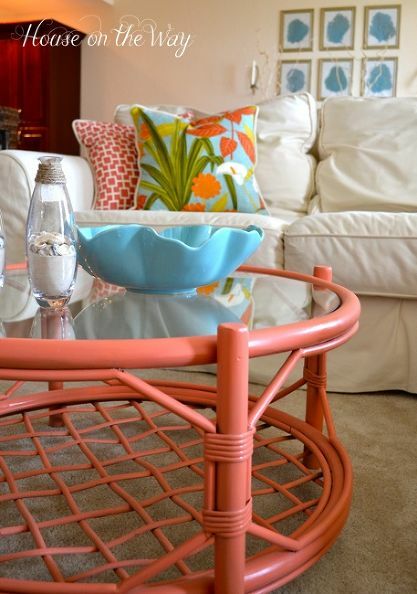 This coffee table is so fun, and I love the beachy feel it evokes! The perfect centerpiece for her living room! 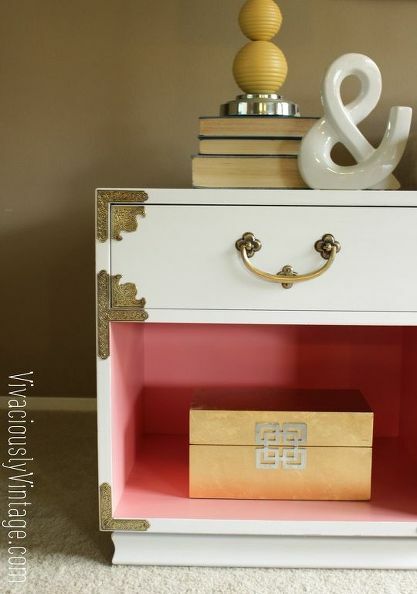 This nightstand is super cute, and the same colors as Reagan's nursery! I love the mint green and coral combination! A new classic!!! This adorbs pair of midcentury modern nightstands remind me of my recent nightstand makeover - the one that sparked this entire HomeTalk feature! I just love any piece of furniture with a surprise on the inside. Whether it's just a simple solid color like I used or this gorgeous coral and white damask pattern! Last but not least, here is my vintage campaign style nightstand that is reminiscent of the pair above! Check out her full story here and how I just couldn't part with what I'd originally meant to sell. (Click here to see the post on HomeTalk.) I just love all campaign style furniture! When I saw this ugly duckling in Goodwill I just couldn't get over that hardware! I've never seen campaign hardware that was so ornate and detailed! Have you joined the coral craze? What do you think of all the different shades? Do you prefer a pinky coral, an orangy coral, or a very vibrant coral? There are just so many good choices!!! If you subscribe to HomeTalk, be sure to look out for my board feature in your email! Looove this! 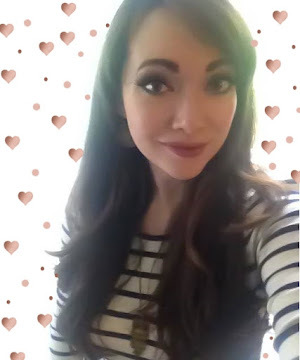 Sooooo pretty! 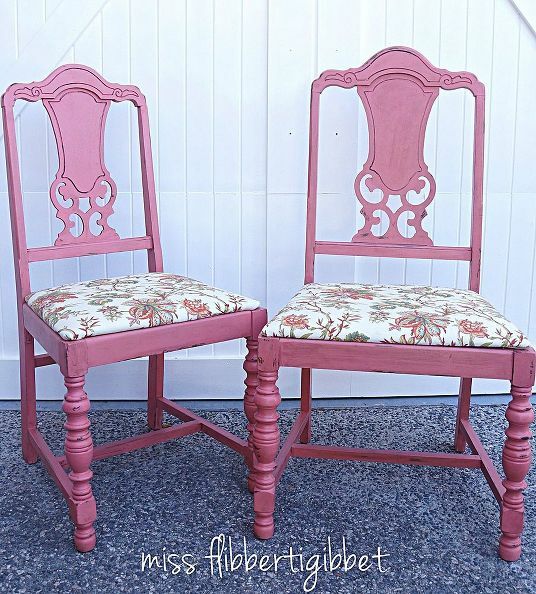 I love the idea of a pop of pink or coral on furniture.